With an MSRP of $249, the 11.6-inch Samsung Chromebook is marketed as the "computer for everyone". The Chromebook features a Samsung Exynos 5250 processor, 2 GB system RAM, a 16 GB SSD, and a display resolution of 1366x768. This combination allows the device to be both lightweight (less than 2.5 pounds), less than one inch thick, and provide a battery runtime of up to 6.3 hours. The SSD allows the device to be quick and responsive, allowing for wake-from-sleep in one second and boot times of less than 10 seconds. The Chromebook includes built-in cloud storage via Google Drive. The device also features connectivity one might expect from a full-fledged notebook – a USB 3.0 port, a USB 2.0 port, an SD card reader, and 2x2 802.11a/b/g/n Wi-Fi. The Chromebook is available now at Best Buy, Amazon, Staples, TigerDirect, and Newegg for $249. RIDGEFIELD PARK, N.J., OCTOBER 18, 2012 – Samsung Electronics America, Inc. today announced the new Samsung Chromebook, its latest lightweight, portable and easy-to-use laptop built on Google Chrome OS™. The new Samsung Chromebook is fast – it boots up in less than 10 seconds, resumes near instantly and has a long battery life. The form factor makes it one of the lightest laptops on the market, making it an ideal choice for people on the go, families using it around the house and students at school. The new Samsung Chromebook features Samsung’s renowned, sleek design identity. It weighs less than 2.5 pounds and measures less than an inch thick, making it effortless to carry anywhere. The full-sized keyboard results in maximum convenience and productivity, and the 11.6-inch screen is ideal for all needs, from viewing photos and work documents to chatting face-to-face using the built-in webcam. The Samsung Chromebook resumes from sleep mode in just one second and boots up in under 10 seconds, enabling users to jump into work or play nearly instantly and, unlike traditional computers, doesn’t slow down over time. With a 16 GB*** SSD and 2GB of RAM, users have all the power they need for social networking, homework, watching videos, looking at photos and more. A hardware-accelerated user interface results in smoother scrolling on the trackpad, making activities like browsing the web or playing games even more enjoyable. Battery life of more than six hours** allows for extended computing without needing to find a power source. Google developed Chrome OS with three key factors in mind: speed, simplicity and security, and has improved on these factors since the launch of the first Chromebook in 2011. With Chromebooks, you can get online in seconds, load web pages with incredible speed and access all of your favorite apps in one click through the app launcher. 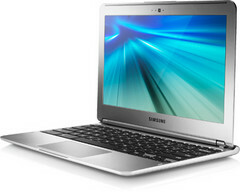 Automatic updates mean that Samsung Chromebook users always receive the latest functionality, without any hassle. Security features are also built-in and updated to defend against the ongoing threat of malware and viruses, reducing the need for users to install anti-virus software. Built-in cloud storage with Google Drive enables Chromebook users to access their files securely from anywhere, and sync technology backs up all of your preferences, bookmarks and apps, so you can easily access them from a Chrome browser on another device. The Samsung Chromebook is now available for pre-order. It will be available at Best Buy, Amazon, Staples, Tiger.com and Newegg.com beginning October 22 for an MSRP of $249.99.